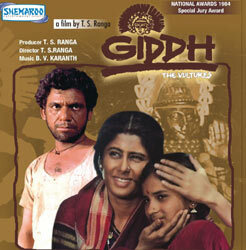 This older South Indian movie, Giddh, written and directed by T.S. Ranga, is available from Netflix or online downloading, with a nice small blog article at http://parallelcinema.blogspot.com/2005/08/giddh-1984-vultures.html. 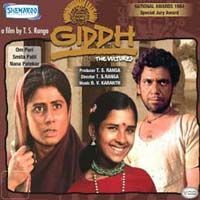 Set in Karnataka, the movie features Hannumakka (Smita Patil) as a devadasi or devotee or initiate of the goddess Yellamma, the village goddess, who everyone worships and fears, while Om Puri plays Bachiya, a sort of pimp or jack-of-all-trades who stays close to Hannumakka and her sister who has one daughter, Lakshmi. The story is both about the villager’s trials with poverty and the efforts of Hannumakka and Bachiya and the village teacher to save Lakshmi from either a direct life of prostitution or an indirect life of prostitution if she is also initiated as a devadasi to Yellamma (see http://en.wikipedia.org/wiki/Devadasi for an extensive coverage of the link between serving the goddess Yellamma and serving as a prostitute in a village). Several conflicts intertwine. First, as the village is excessively poor and the land without water, villagers are anxious not to anger Yellamma and make their luck even worse. So it would be good, they debate, if they initiated Lakshmi to the goddess, as suggested by their feudal landlord–but it is expensive, so they would need the financial support of the same rich landlord of the village who, as we see below, has ulterior motives for making this suggestion. Further, Hannumakka’s sister has also promised Lakshmi to a local rich man who has paid to have first access to her virginity, whereas the original rich local lord, Desai (Achyut Potdar) also has his eyes on her and tries several ways to get his own hands on her first—he indicates to the girl’s father that she should be initiated as a devadasi to Yellamma, because the family is so poor, then when that tactic fails he tries to outbid the other rich man in actual cash payment to the girl’s mother–finally he simply attempts to abduct the girl outright. Another problem in the village is the local young man who rounds up the girls and takes them to Mumbai where he converts them into prostitutes in order to provide some small sums of money to their families in the village. Even this young man has his sights set on Lakshmi as a promising young prostitute. Against all these odds, Hannumakka is outspoken in front of the villagers, in her family, towards Desai, and even towards the other rich lord who wants Lakshmi. She is very cognizant that the rich lord has proposed that Lakshmi be initiated so that he can take her virginity, and that he is using the villagers’ superstitions or god worship to render them fearful so as to get his own agenda met. But no matter how persuasively Hannumakka argues, no one listens to her. So far Lakshmi has been spared because she hasn’t reached puberty yet, but when she does, Hannumakka and Bachiya concoct a plan to make her escape the village and take a bus to Mumbai to her uncle there who will raise and educate her properly and safely. However, when they try this once, they miss the bus and find themselves trapped by Desai who tries to forcibly detain the girl at his compound, but Hannumakka starts a fire as a distraction and she and Bachiya grab Lakshmi and take her home. They are finally able to escape with Lakshmi to the road and put her aboard the bus to Mumbai, but unfortunately the young village pimp gets aboard at another village, recognizes Lakshmi, and the film ends with her trustingly snuggling against him to nap through the long journey. The film ends on this ambivalent tone both to juxtapose action and fate, and to leave an open ending as to whether the uncle will indeed save Lakshmi or she’ll wind up a prostitute after all. There are several elements that I enjoyed most about this movie. One is the absolute realism of the mise-en-scene and directing. This is not the average Bollywood film with fake sets and singing and dancing, although there is a song interlude when Hannumakka and another devotee sing about/to Yellamma. However, it is more of a folk song rather than a big performance. Otherwise, the village is realistic. People are dirty, they look hungry and tired and without water. They wear no shoes, their houses are authentically poor and ramshackle, the men waste their few resources getting drunk at the local watering hole. Whether the director used real villagers or actors for supporting parts is uncertain, as I’ve not found anything written about the film, but it was spectacular to see Om Puri, a renowned actor, running barefoot through the village and countryside dust. Even the opening credits of the film show actual photos of prostitutes to set the scene for the conflict of the movie—trying to save one village girl from this fate. Further, the subject of the film is realistic—Karnataka made it illegal to make girls into devadasis in the mid-1980s, the time when this film was directed—all of India did so in the late 1980s. Yet the practice continues, as does the phenomenon of young girls being taken from villages to large cities to become prostitutes, or turned into prostitutes within the villages themselves. What the film tries to underscore is the absolute poverty that makes this alternative seem an acceptable option for women, yet a poverty juxtaposed to absolute wealth such as the landlord whose riches will give him deflowering privileges of the devadasis. The landlord earns his wealth upon the backs of the villagers, and his privileges come at the expense of the villagers’ mores and superstitions. One scene I enjoyed is when a contractor was about to give money to a man, and his wife snatches it up and proclaims that since he would just drink it up anyway, she’d better take the money. The film does show quite a lot of drinking alcohol, even though or because of the poverty abounding. The rich as well as the poor seem to constantly consume the liquor that seems to be primarily the solace for men, but even Hannumakka at one point turns to drink when she despairs of saving Lakshmi and bemoans her fate that she has been rendered a prostitute rather than a proper wife, which she wanted to be when young. That is why she is so determined to save at least one girl from her own fate—she knows the price to pay. One reason she turns to drink is that she was so proud of being able to marry off one of the village girls, but one night the girl returns alone to the village, having run off from her married home because she can’t stand married life and would prefer the life of the local prostitute! This sends Hannumakka over the edge and makes her doubly intent on saving Lakshmi. I recall that Indian women took up the issue of men’s drinking quite stridently during the 1990s, stopping liquor delivery trucks and destroying the contents, because liquor was such a devastating influence on villages suffering already from poverty, drought, and social problems. The film includes several instances in which the wealthy of the area can abuse their power over “regular” villagers. For example, the village teacher wants to oppose the rich landlord’s desire for Lakshmi, so the landlord has the teacher transferred to a distant and smaller village. The landlord can have Hannumakka arrested for starting a fire on his property, while the villagers cannot protest against the landlord’s goons trying to kidnap Lakshmi from her own home in the middle of the night. The landlord can order his goons to beat Bachiya near to death for not helping him get Lakshmi, but Bachiya cannot retaliate at all. The rich comprise one component of the vultures of the title, which also include the pimps that take off young girls to the cities to become prostitutes, and the police that can be bought off by the wealthy. There is not a lot of action or drama per se in this film; the drama stems from your identification or not with Hannumakka and Bachiya’s goal of saving Lakshmi against all odds, against family, against tradition, against the local wealthy, against the local pimp, even against her own childish unawareness of the odds at stake. If we can identify with Hannumakka, the rebel, the aware, the sad, the sick, and if we as viewers are cognizant and aware of the difficulties faced by most prostitutes and devadasis, then the film’s drama indeed propels us through the near two hours of the film, yet the film closure or lack thereof leaves us dismayed at the potential for yet another intervention of fate to ruin an innocent girl’s life. It is important that the film does not offer marriage as a panacea remedy. Women’s lives can be as difficult in marriage as in prostitution; in fact, the village prostitute seems to be the healthy, happy, beauty in a film filled with struggle and sadness. She’s not carrying rocks on her head building a road, or clearing a field bent over all day long, scraping for food, or having a disproving husband constantly nag and torture her. She’s free, she has money, she’s sympathetic. She’s plump while others struggle to find something to eat. She’s not embarrassed by her role either. Thus there’s a contradiction in Hannumakka as a devadasi and prostitute who resents her fate, and the happy prostitute who makes the most of her position. What really seems at stake is that it is young girls who are being targeted—girls who like Lakshmi don’t really understand what is in store for them whether they are married off or sold into prostitution or initiated into a devadasi. It is one thing for adult or more mature women to decide their own fate, yet another for adults to make fates for the innocent who have no right to choose. Hannumakka and Bachiya try to send Lakshmi to Mumbai to grow up, to be educated, to have the option to make a choice rather than to be chosen for, especially when Hannumakka has to face the reality that marriage is not always the salvation she sentimentally dreamed it would be. While Giddh deals with the variety of issues surrounding prostitution and village life that leads to it as well as devadasis, the film is not a simple condemnation, as noted above. Both sides or approaches are presented. Hannumakka is not happy as a devadasi, but another woman is perfectly content to serve the goddess and perform the ancillary duties. The village prostitute is perfectly happy with her role, whereas Hannumakka and Bachiya try desperately to save the young girls from similar fates. Of course, we are not shown the bleak sides of prostitution in the big cities, the harshness of the realities for the girls taken off to Mumbai, we are left to imagine, as we are left to imagine the ending of the film. This entry was posted in netflix films and tagged cinema, cinema and culture, film, Giddh, hindi, india, international cinema, international film, international movies, T.S. Ranga, Vultures. Bookmark the permalink.